Certain obvious advantages are connected with such a solution of the problem. In the first place, a logical advantage. A man can believe only what he holds to be true. We are Christians because we hold Christianity to be true. But other men hold Christianity to be false. Who is right? That question can be settled only by an examination and comparison of the reasons adduced on both sides. It is true, one of the grounds for our belief is an inward experience that we cannot share – the great experience begun by conviction of sin and conversion and continued by communion with God – an experience which other men do not possess, and upon which, therefore, we cannot directly base an argument. But if our position is correct, we ought at least to be able to show the other man that his reasons may be inconclusive. And that involves careful study of both sides of the question. Furthermore, the field of Christianity is the world. The Christian cannot be satisfied so long as any human activity is either opposed to Christianity or out of all connection with Christianity. Christianity must pervade not merely all nations, but also all of human thought. The Christian, therefore, cannot be indifferent to any branch of earnest human endeavor. It must all be brought into some relation to the gospel. It must be studied either in order to be demonstrated as false, or else in order to be made useful in advancing the Kingdom of God. The Kingdom must be advanced not merely extensively, but also intensively. The Church must seek to conquer not merely every man for Christ, but also the whole of man. We are accustomed to encourage ourselves in our discouragements by the thought of the time when every knee shall bow and every tongue confess that Jesus is Lord. No less inspiring is the other aspect of that same great consummation. That will also be a time when doubts have disappeared, when every contradiction has been removed, when all of science converges to one great conviction, when all of art is devoted to one great end, when all of human thinking is permeated by the refining, ennobling influence of Jesus, when every thought has been brought into subjection to the obedience of Christ. If to some of our practical men, these advantages of our solution of the problem seem to be intangible, we can point to the merely numerical advantage of intellectual and artistic activity within the Church. We are all agreed that at least one great function of the Church is the conversion of individual men. The missionary movement is the great religious movement of our day. Now it is perfectly true that men must be brought to Christ one by one. There are no labor-saving devices in evangelism. It is all hand-work. And yet it would be a great mistake to suppose that all men are equally well prepared to receive the gospel. It is true that the decisive thing is the regenerative power of God. That can overcome all lack of preparation, and the absence of that makes even the best preparation useless. But as a matter of fact God usually exerts that power in connection with certain prior conditions of the human mind, and it should be ours to create, so far as we can, with the help of God, those favorable conditions for the reception of the gospel. False ideas are the greatest obstacles to the reception of the gospel. We may preach with all the fervor of a reformer and yet succeed only in winning a straggler here and there, if we permit the whole collective thought of the nation or of the world to be controlled by ideas which, by the resistless force of logic, prevent Christianity from being regarded as anything more than a harmless delusion. Under such circumstances, what God desires us to do is to destroy the obstacle at its root. Many would have the seminaries combat error by attacking it as it is taught by its popular exponents. Instead of that they confuse their students with a lot of German names unknown outside the walls of the universities. That method of procedure is based simply upon a profound belief in the pervasiveness of ideas. What is today matter of academic speculation begins tomorrow to move armies and pull down empires. In that second stage, it has gone too far to be combated; the time to stop it was when it was still a matter of impassionate debate. So as Christians we should try to mold the thought of the world in such a way as to make the acceptance of Christianity something more than a logical absurdity. Thoughtful men are wondering why the students of our great * Eastern universities no longer enter the ministry or display any very vital interest in Christianity. Various totally inadequate explanations are proposed, such as the increasing attractiveness of other professions – an absurd explanation, by the way, since other professions are becoming so over-crowded that a man can barely make a living in them. The real difficulty amounts to this – that the thought of the day, as it makes itself most strongly felt in the universities, but from them spreads inevitably to the masses of the people, is profoundly opposed to Christianity, or at least – what is nearly as bad – it is out of all connection with Christianity. The Church is unable either to combat it or to assimilate it, because the Church simply does not understand it. Under such circumstances, what more pressing duty than for those who have received the mighty experience of regeneration, who. therefore, do not, like the world, neglect that whole series of vitally relevant facts which is embraced in Christian experience – what more pressing duty than for these men to make themselves masters of the thought of the world in order to make it an instrument of truth instead of error? The Church has no right to be so absorbed in helping the individual that she forgets the world. There are two objections to our solution of the problem. If you bring culture and Christianity thus into close union – in the first place, will not Christianity destroy culture? Must not art and science be independent in order to flourish? We answer that it all depends upon the nature of their dependence. Subjection to any external authority or even to any human authority would be fatal to art and science. But subjection to God is entirely different. Dedication of human powers to God is found, as a matter of fact, not to destroy but to heighten them. God gave those powers. He understands them well enough not bunglingly to destroy His own gifts. In the second place, will not culture destroy Christianity? Is it not far easier to be an earnest Christian if you confine your attention to the Bible and do not risk being led astray by the thought of the world? We answer, of course it is easier. Shut yourself up in an intellectual monastery, do not disturb yourself with the thoughts of unregenerate men, and of course you will find it easier to be a Christian, just as it is easier to be a good soldier in comfortable winter quarters than it is on the field of battle. You save your own soul – but the Lord’s enemies remain in possession of the field. But by whom is this task of transforming the unwieldy, resisting mass of human thought until it becomes subservient to the gospel – by whom is this task to be accomplished? To some extent, no doubt, by professors in theological seminaries and universities. But the ordinary minister of the gospel cannot shirk his responsibility. It is a great mistake to suppose that investigation can successfully be carried on by a few specialists whose work is of interest to nobody but themselves. Many men of many minds are needed. What we need first of all, especially in our **American churches, is a more general interest in the problems of theological science. Without that, the specialist is without the stimulating atmosphere which nerves him to do his work. But no matter what his station in life, the scholar must be a regenerated man – he must yield to no one in the intensity and depth of his religious experience. We are well supplied in the world with excellent scholars who are without that qualification. They are doing useful work in detail, in Biblical philology, in exegesis, in Biblical theology, and in other branches of study. But they are not accomplishing the great task, they are not assimilating modern thought to Christianity, because they are without that experience of God’s power in the soul which is of the essence of Christianity. They have only one side for the comparison. Modern thought they know, but Christianity is really foreign to them. It is just that great inward experience which it is the function of the true Christian scholar to bring into some sort of connection with the thought of the world. During the last thirty years there has been a tremendous defection from the Christian Church. It is evidenced even by things that lie on the surface. For example, by the decline in church attendance and in Sabbath observance and in the number of candidates for the ministry. Special explanations, it is true, are sometimes given for these discouraging tendencies. But why should we deceive ourselves, why comfort ourselves by palliative explanations? Let us face the facts. The falling off in church attendance, the neglect of Sabbath observance – these things are simply surface indications of a decline in the power of Christianity. Christianity is exerting a far less powerful direct influence in the civilized world today than it was exerting thirty years ago. What is the cause of this tremendous defection? For my part, I have little hesitation in saying that it lies chiefly in the intellectual sphere. Men do not accept Christianity because they can no longer be convinced that Christianity is true. It may be useful, but is it true? Other explanations, of course, are given. The modern defection from the Church is explained by the practical materialism of the age. Men are so much engrossed in making money that they have no time for spiritual things. That explanation has a certain range of validity. But its range is limited. It applies perhaps to the boom towns of the West, where men are intoxicated by sudden possibilities of boundless wealth. But the defection from Christianity is far broader than that. It is felt in the settled countries of Europe even more strongly than in America. It is felt among the poor just as strongly as among the rich. Finally it is felt most strongly of all in the universities, and that is only one indication more that the true cause of the defection is intellectual. To a very large extent, the students of our great Eastern universities – and still more the universities of Europe – are not Christians. And they are not Christians often just because they are students. The thought of the day, as it makes itself most strongly felt in the universities, is profoundly opposed to Christianity, or at least it is out of connection with Christianity. *The prominent American universities located in the north-eastern part of the country – Harvard, Yale, Princeton, etc. 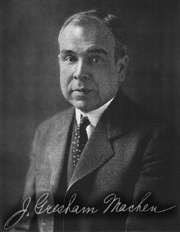 **Although originally written for an American audience, Machen’s observations and recommendations are of utmost relevance to present day Nigeria and, in fact, every modern society.